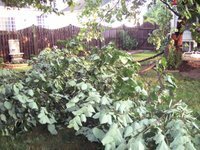 Not only did it take out half of my redbud tree, but the wind also took down my twenty year old, silver maple tree in the front yard. That tree was around 30-35 feet tall and really provided a lot of shade for the house. It is a sad day around here. The good news is that the silver maple didn't land ON the house and really didn't do too much damage...other than to our pocketbook to have it removed! The last time I saw a weather map that looked like it did last night, was when we had the tornado in the neighborhood. It is never a good sign to see ALL RED on the weather map. A lot of folks have been without electricity for almost 18 hours. Maddy, Tommy's dog was not liking the storm at all and was reportedly shaking like a leaf and hyperventilating. She finally settled down some when Tommy let her crawl into Becky's dark closet and hide. Becky was out of town and was unable to comfort the puppers. They were without electricity for a while last night. Traffice this morning was horrific due to traffic lights being out. The happy campers of the day were the tree companies that began knocking on doors to drum up business for tree removal. I had to work but Tom captured the action of the tree removal pretty well...it was pretty amazing how the guy climbed the tree to take it down. 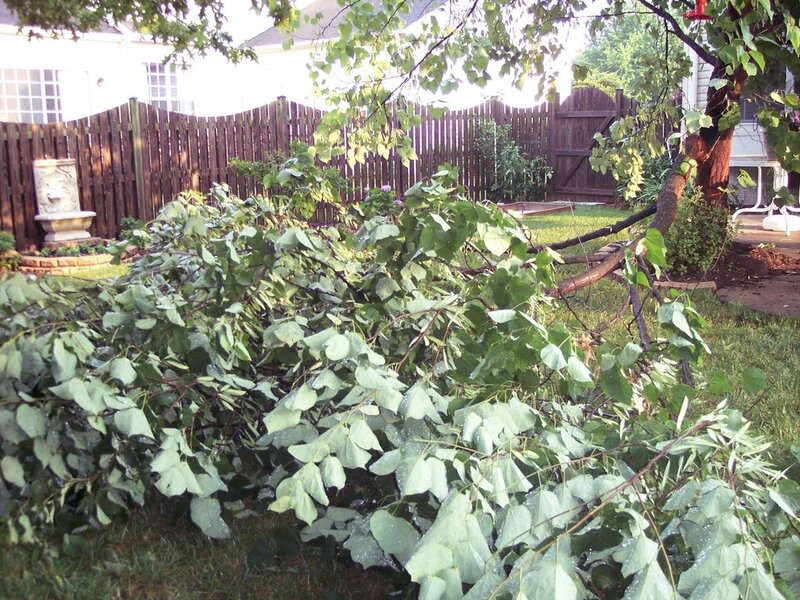 I was not totally bent out of shape about the loss of the silver maple tree...I'm more upset about my redbud tree. i was just going to say, you're lucky the trees didnt fall into the house... or we would've been over at your place checking it out, which I would've have minded since we did get about 30 calls within that two hours span of the storm... speaking of no one getting sleep, we didnt get back to teh station til past 3am, which really sucked. We had a call for a tree into a house. Ends up being a house for a couple that just bought it AND was on their HONEYMOON. Anyways, at least everyones safe and sound. We're lucky no one got hurt. See yas! So sorry! 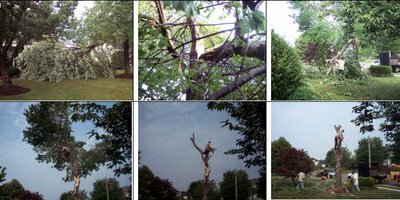 Was that "the" redbud tree you posted about a few months ago--the one that caused all the trouble with your boys and the basketball court? That happened to us many years ago in our first home--two days before Christmas! A Nor'Easter hit and I just knew that tree was going to be trouble. It was a 50-75 year old maple with roots growing out over (and lifting) our sidewalk. It came down that night around midnight or so. I heard a loud splitting crack and pushed Bobby off the bed and to the floor! That tree could (and should) have come right through the roof of our bedroom, but someone was looking out for us. It literally wrapped itself around the house causing very little structural damage (with the exception of our newly installed gutters) and took the electrical, cable and telephone wires with it. We were lucky--although without power for the next four days! It was Bobby's first Christmas Eve off from work. I cooked a pot roast dinner at my Dad's and then brought it back home to keep it hot in the fireplace. "A" was so upset and worried that Santa wouldn't find her if we slept elsewhere, so the four of us slept on the living room floor in front of the fireplace with Bobby and I taking turns tending the fire all night! Good luck with the clean-up! It was "the" redbud tree that the boys hated due to basketball. I am still sad but am hopeful that it will make it. Half of the tree is gone but the other half looks ok for now. We also were lucky that the silver maple didn't fall through our bedroom or do any damage but the new gutter. Sounds like you had a memorable Christmas that year. Those are always the ones we remember! I lost 5 pounds working on the cleanup over the weekend...WHAT A JOB! Thanks for reading and commenting.